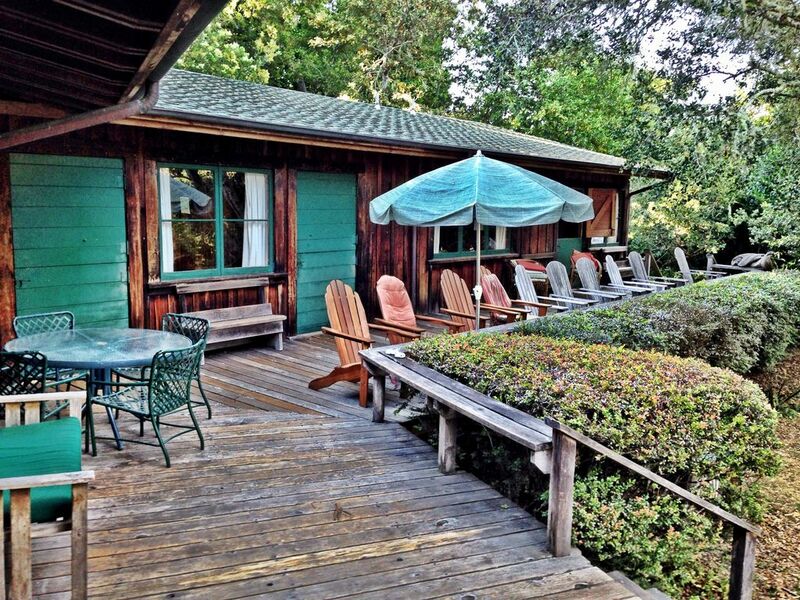 Come stay at The Colby House, our family's vacation home for 80 years! Sleeps 9 in 5 bedrooms including 1 King, 2 Queens, 1 single twin, 1 double twin room. Tennis court and fenced 1 acre yard with oak trees. Come play tennis under the oak tree canopy, on the lined asphalt court in great condition. Musically inclined? Play our piano. Need to stay in touch with the office or access the web? We have wireless (wifi) access to high speed internet and unlimited long distance phone calls are provided on the 'land line' to our guests. Each room opens out to the expansive deck, for independent and private access. Great windows front and back and 'dutch doors' - open the top half and let in the light and air and music of the birds. Enjoy the cool morning and evening air under your down duvet! The location is ideal for a peaceful stay but also supports an active lifestyle for adults and kids - extended families love it! Located across the street from the Inverness school and playground. Walk on the trails or down to the Inverness General Store, gift shop and restaurants. Drive to nearby Tomales Bay State Park swimming beaches, including Shell Beach or out to the Point Reyes Lighthouse or the special ocean beaches. Kayaking and sailing are popular on Tomales Bay (kayaks can be rented). Other quality restaurants are nearby in Point Reyes Station and Olema, just a few miles away. If you are like us, you will want to spend some of your time in the very private, park like setting, playing tennis, climbing trees, playing board games or reading books in the cozy living room by the fire or on the deck shaded by oak trees. Pick blackberries in the summer, particularly in late July and in August. That formula has worked for five generations in our family, enjoying the magic of Inverness since 1914. The main house and tennis court date back to the 1890s with the rest of the house added in the 1930s. The master king suite over the garage has a bath/shower. The main bathroom next to one of the queen bed rooms has an updated shower. Washer and dryer in the separate garage. Many of our guests become 'regulars' who we welcome back year after year. We hope you will find our property worthy of becoming one of your special vacation spots, enjoying Inverness and exploring the Point Reyes National Seashore. Mike Brown and his family are the Bay Area Colby family members who own the Colby House. Mike's grandparents Henry and Ruth Colby bought the property in the 1930s and raised their children with long summers at the house. The main house was built in the 1890s, along with the tennis court, but Henry added several bedrooms after buying the house. Mike's Aunt Mary Colby McKey is another owner of the Colby House, and her passion has been to retain the history and 'feel' of the house from her childhood. All of the children, grandchildren and great grandchildren of Henry and Ruth Colby have their favorite memories and activities associated with the Colby House. It was the dream of Ruth Colby that the Colby House would remain in the family and that new people would have the chance to experience the magic of this special place. Special memories include summer and winter holiday weekends and extended visits; special activities include playing cards and games in the living room; short drives to the Tomales Bay beaches, particularly Shell Beach where Ruth Colby used to drive each day in the summer to swim after 4:30pm; longer drives out to the beautiful ocean beaches, particularly McClures, but also to enjoy the wildflowers and to look for the Tule Elk who live in their own preserve. And, to be honest, it is common to stay on the property and take walks around the neighborhood and lose all ambition as the property itself is incredible and very relaxing when sitting on the deck! The property is very private, with almost a full acre and the entire side of the block of Park Avenue, up from Forres Way where our green gates face the Inverness School. Within the property is the newly resurfaced and restriped tennis court, and an oak tree next to the deck which is suitable for climbing (and with a rope swing as well)! Everyone enjoys sitting on the deck in the summer to enjoy every meal! Our property managers provide fresh linens including sheets and towels. Large load washer and dryer. Parking is provided for a maximum of four cars. Ping pong table in the garage. Our private tennis court is regularly maintained for your enjoyment. This one acre secluded and wooded property has a private, full-sized tennis court which is regularly maintained for the enjoyment of our guests. In addition, we kindly ask our guests to help us maintain good relationships within our neighborhood by respecting the peaceful and quiet environment. Parties/group gatherings of more than 15 people must have the property manager's prior approval. We just spent the weekend at this amazing home. Even though it rained most of the time we still loved it. Thanks again for sharing your family's retreat. Oozes charm. Large and commodious. Lots of room to spread out with just enough old world funk to keep it interesting. We had a blast! A great place for a big group with kids who are up for being outdoorsy. The main family room is roomy and perfect for a group. The bedrooms are well set up for families. We loved the relaxed, fun camp-like atmosphere of Colby House. Between frequent rounds of tennis, hikes, dinners and games around the fire, it was the ideal location for our group. The house has a large private yard for children to play in, Blackberry bushes to pick berries to enjoy for breakfast. We went in late August it was overcast and cool and beach but we still enjoyed hiking, walking the beaches seeing whales and enjoyed the sand sculpture event they had at Drakes beach. The house is simple with durable furniture beds were comfortable. Great home for intergenerational group. Lots to do and out door areas are conducive for group activities, including eating. An additional charge of $25 for cleaning is required for guests who bring a dog. We require a security deposit of $150, and $400 if guests are bringing a dog. Rates are subject to change until confirmed by phone or e-mail. TOT, also known as a “hotel tax,” is authorized under State Revenue and Taxation Code Section 7280. TOT is levied at 10% in the unincorporated Marin County for the privilege of occupying a room(s) or other living spaces in a hotel, inn, motel, vacation home, house or other lodging for a period of 30 days or less. TOT is collected by the operator, but the tax is imposed on the guest. Effective January 1, 2019, the TOT rate increased to 14% for short-term rentals and 4% for campgrounds in West Marin. Per the County ordinance, "Rent" means all charges paid by the guest “for the occupancy of space” without any deduction therefrom, whatsoever. The County imposes the hotel tax on the nightly rental rate and the cleaning fees.